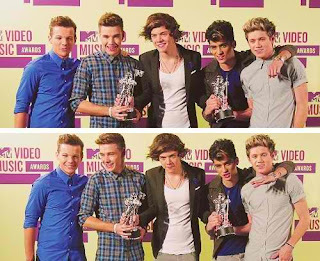 British boy band One Direction dominated last night's MTV Video Music Awards 2012 (or the 2012 MTV VMAs) winning 3 VMAs, followed by Chris Brown with 2 awards. With their nominated video "What Makes You Beautiful", One Direction was able to beat 2-time VMA winner Justin Bieber in 2 categories of the 2012 MTV VMAs where they're both nominated: Best Pop Video and the Most Share-Worthy Video award (which was voted online thru MTV VMAs official site). The group also won as Best New Artist, the same award won by Bieber during the 2010 MTV VMAs. Video of the Year - Rihanna, "We Found Love"
Best New Artist - One Direction, "What Makes You Beautiful"
Best Hip-Hop Video - Drake feat. Lil Wayne, "HYFR"
Best Male Video - Chris Brown, "Turn Up the Music"
Best Female Video - Nicki Minaj, "Starships"
Best Electronic Dance Music Video - Calvin Harris, "Feel So Close"
Best Art Direction - Katy Perry, "Wide Awake"
Best Choreography - Chris Brown, "Turn Up the Music"
Best Cinematography - M.I.A., "Bad Girls"
Best Direction - M.I.A., "Bad Girls"
Best Editing - Beyoncé, "Countdown"
Best Visual Effects - Skrillex, "First of the Year (Equinox)"
Best Video With a Message - Demi Lovato, "Skyscraper"
Most Share-worthy Video - One Direction, "What Makes You Beautiful"